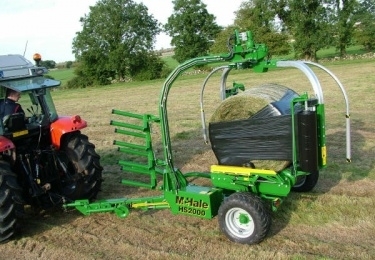 The McHale HS2000 high speed round bale wrapper brings high speed trailed and inline round bale wrapping to a new level! The lift arm on the HS2000 round bale wrapper is designed to centre the bale and the wrapping table cradles the bale gently into the bale wrapping position. When the bale is in position on the HS2000 round bale wrapper the wrapping process commences with the two 750mm dispensers quickly wrapping the round bale. The all-weather cut and ties automatically cut and hold the film and the wrapping table tips rearward placing the wrapped silage bale on the ground.